True, it’s not winter anymore. Here in upstate New York it’s that weird season between winter and spring they don’t teach you about in school. But there’s still snow on the ground, which means I can review a stout! 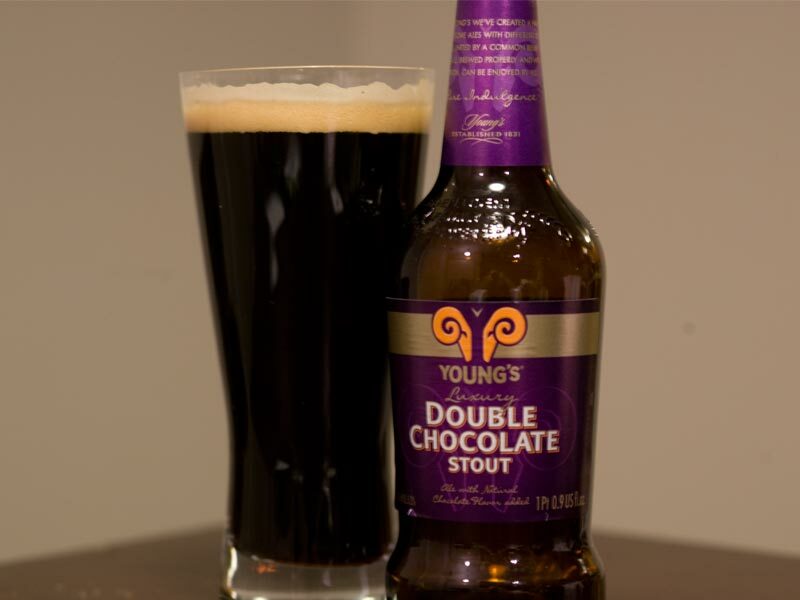 Today’s selection is a yummy chocolate stout from Wells and Young’s in Bedfordshire, England. As you can see, Young’s Double Chocolate Stout is beautifully dark with an almost hint of ruby, and a nice thick head on it (if poured right.) When you first open the bottle, or inhale the aromas from the glass, you immediately get “chocolate.” This ain’t yo mamma’s chocolate stout, baby. As you sip, you get more and more of that wonderful chocolate taste, and the hops add just the right amount of bitterness. The best part is, if you don’t like coffee stouts, in this beer the roasted malt flavor does not come out strongly. It is definitely a chocolate stout–not an espresso stout. Unlike most stouts, this one is only about 5.2% ABV–so one pint won’t leave you feeling like you just played a round of Flippy Cup. All in all, this is a great beer, especially for those of us who don’t usually care for very dark beers. If you like chocolate and you like beer, you simply must try this at least once. While in Geneva, Eric and I stopped at the Beef ‘n Brew. It’s a fairly new restaurant, only been open two months, but their beer selection is to die for! They have about 15 beers on tap (mostly domestic mass-produced crap), but they have at least 50 selections in bottles. Probably more. I decided to take a break from my normal light lager dinner selection and I decided to try an English Brown Ale by the name of Hobgoblin from the Wychwood Brewery in Oxfordshire, England. Yes, I picked it because of the name. It’s not often you find a beer that is so obviously aimed at the computer-gaming/fantasy/D&D type crowd. Which I happen to belong to. (What can I say, I love my fantasy-based RPG/adventure games.) On to the review. The creators claim this is a “ruby beer”. I agree as long as “ruby” means “cross between red ale and stout.” Which is exactly what it tastes like. My concern before the beer even showed up was that it would be too bitter for my tastes. It wasn’t. You certainly get the taste of the hops but it isn’t overwhelming. If you don’t like overly bitter beers, this one is a dark to try. While you drink it, you get hints of chocolate, which I love. The bottle itself was very drinkable, but I think this is a one-and-done beer. Drink this beer while you’re eating something beefy-be that stew, burgers, or steak. I happened to be eating fish and chips with it. Very English night for me. Overall the Hobgoblin was very good, but what made it special was the label and the name, not necessarily the taste. I would certainly try Wychwood’s other creations if given the chance. I’d give you a “try this if you like” recommendation but I don’t have anything that comes to mind. If someone else has a comparison, feel free to let me know. Like The Guide on Facebook! Please don't steal my content. It's not very nice. Linking is ALWAYS welcome. A 20-Something Girl's Guide to Beer by Robin S is licensed under a Creative Commons Attribution-NonCommercial-NoDerivs 3.0 Unported License.